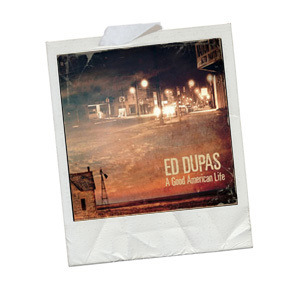 Born in Texas, raised in Winnipeg and now living in the Detroit area Ed Dupas (pronounced doo-PAH) is one helluva a storyteller with a voice born from a life of hurt, work and carousing bars. Many if not most tracks on this album are quite straightforward blue-collar Country-Folk songs that could or should have come from the pens of Springsteen, Kristofferson or more recently Sturgill Simpson; but the title track A Good American Life stands out head and shoulders above absolutely everything else. Lashed full of irony the song is akin to Born in the USA as at first it sounds like a rabble-rouser but after repeated listening you finally hear that the words come from deep in the heart of the Liberal Left; which is a very good thing in my book. On songs like Home in Time you can easily picture Dupas huddled over his guitar with eyes tightly closed as he squeezes and spits out the poetic words as if they were his dying breaths. It really is a tragically beautiful song. Small towns and big love are the central theme here with Until Blue Comes ‘Round and You Don’t Get To Explain both being subtly brittle love songs of hurt and regret; possibly written after a long night drinking tequila and listening to old Willie Nelson LP’s. In the same vein as the title track Flag could confuse a stupid person; but again if you listen properly you will hear a song about a young man who loves his country and goes to war and doesn’t come back. Quite extraordinary in it’s own way. The album closes with someone offering Dupas a drink before he records Without You and I don’t know what effect the liquid had on him; but the end result is a love song that will melt a heart of stone. For a debut album A Good American Life is truly excellent and will be a welcome inclusion to the libraries of music fans the world over. If you were carelessly thumbing through the racks in a record shop and stumbled on this album, the cover could and should catch your eye. Take it from me that the sepia tinted picture of a small town in the Midwest with photo-shopped scratches proves you really can judge an album by the cover.